The mysterious disappearance of Michael Rockefeller in New Guinea in 1961 has kept the world and his powerful, influential family guessing for years. Now, Carl Hoffman uncovers startling new evidence that finally tells the full, astonishing story. Despite exhaustive searches, no trace of Rockefeller was ever found. Soon after his disappearance, rumors surfaced that he'd been killed and ceremonially eaten by the local Asmat—a native tribe of warriors whose complex culture was built around sacred, reciprocal violence, head hunting, and ritual cannibalism. The Dutch government and the Rockefeller family denied the story, and Michael's death was officially ruled a drowning. Yet doubts lingered. Sensational rumors and stories circulated, fueling speculation and intrigue for decades. The real story has long waited to be told—until now. Retracing Rockefeller's steps, award-winning journalist Carl Hoffman traveled to the jungles of New Guinea, immersing himself in a world of headhunters and cannibals, secret spirits and customs, and getting to know generations of Asmat. Through exhaustive archival research, he uncovered never-before-seen original documents and located witnesses willing to speak publically after fifty years. In Savage Harvest he finally solves this decades-old mystery and illuminates a culture transformed by years of colonial rule, whose people continue to be shaped by ancient customs and lore. 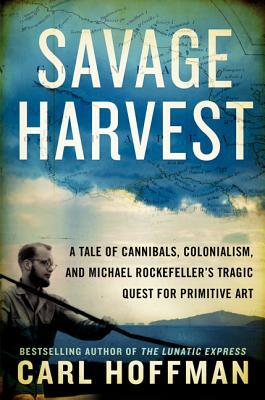 Combining history, art, colonialism, adventure, and ethnography, Savage Harvest is a mesmerizing whodunit, and a fascinating portrait of the clash between two civilizations that resulted in the death of one of America's richest and most powerful scions. Carl Hoffman is the author of the New York Times bestseller Savage Harvest, hailed as a “masterpiece” by Outside and named a New York Times editors’ choice and one of the Washington Post’s 50 notable works of nonfiction for 2014, as well as The Lunatic Express. He is a former contributing editor to National Geographic Traveler and Wired, and has traveled on assignment to eighty countries.